What is the potential effect of shale gas exploration/production on the status of surface waters? Surface waters play a key role in the ecology of aquatic and water-depended ecosystems. 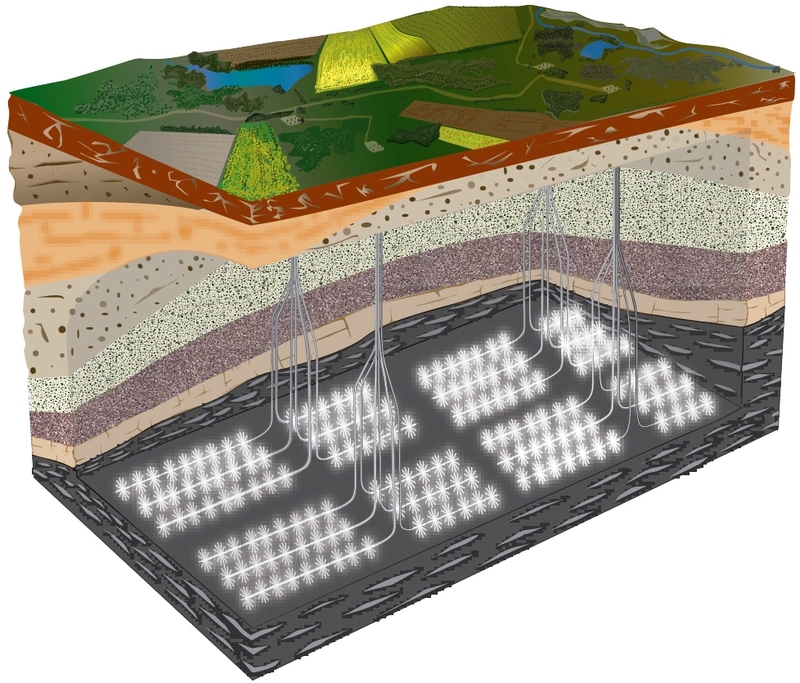 They are recharged mainly by groundwater inflow and runoffs from the ground surface. In Poland, unconventional gas exploration and appraisal areas are located in regions that have diversified hydrographic conditions. The proximity of rivers, lakes and man-made water reservoirs involves potential risks of surface water pollution. Surface water pollution may be caused by water runoff from the drill site area. Moreover, surface water may be used for reservoir stimulation purposes, potentially threatening the hydrological system of the drainage area involved. All of these aspects must be considered at drilling location selection stage. A review of shale gas exploration stages has indicated potential impacts on surface waters that are presented below. 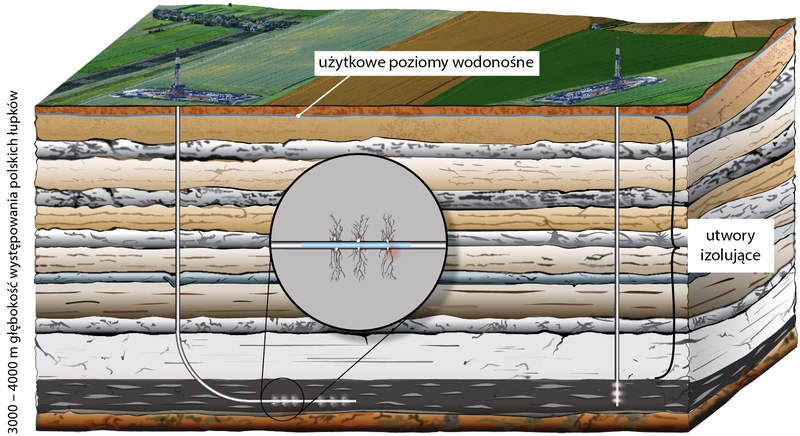 Gas-bearing shales occur in Poland at average depths ranging from 3 to 5 km, in areas of different geology, diverse hydrogeological and hydrographic conditions. Drilling well location in an area of varied hydrographic network means that the safety of surface waters will depend primarily on drill site sealing and properly made stormwater drainage system. Moreover, due to the depth of shale occurrence, the wells have to pass through local aquifers that may be in hydraulic contact with the surface waters. other emergencies (e.g. a rig failure involving spills of process fluids and their penetration to to top aquifers that are in hydraulic contact with the surface waters). other emergencies (e.g. equipment failures involving process fluid spills in the well and on the site surface). Gas may be produced for several decades from several tens of horizontal wells drilled out from a single site (Fig. 3). other emergencies (e.g. equipment failures involving penetration of pollutants to top aquifers that are in hydraulic contact with the surface waters). sealing with impervious sheets and concrete slabs the ground in immediate proximity of the well, as well as by appropriate drainage system for conveying stormwater out of the production site. The purpose of the well abandonment stage is to restore the original intended use of the site area. If not delivered properly, well abandonment operations may involve changes in the local water system from filling of drainage ditches or natural watercourses. Moreover, potential pollution of surface waters by runoff water flowing from the production site should be considered. Exceptionally, well leakage and migration of reservoir gas to the aquifers and the ground surface may occur following the well abandonment. In that case the investor should prepare a recovery plan and cooperate with competent authority so as to minimize environmental impacts and restore integrity of the abandoned well.